I am a Craftsy addict. 🙂 Because there is no quilting tradition in my country, and nowhere for me to take classes locally, this has been a wonderful way for me to continue to learn new techniques and improve my quilting skills. 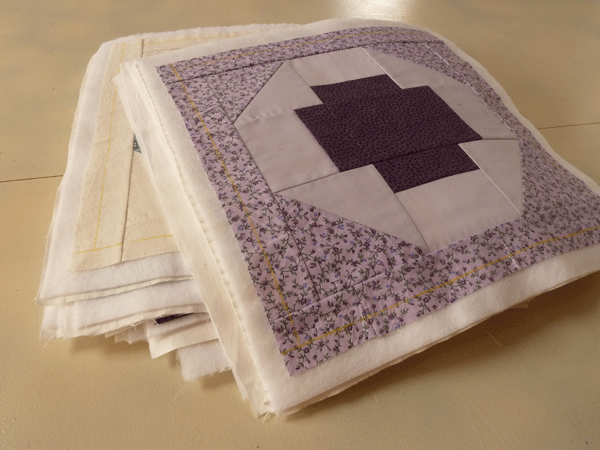 One of the most useful classes I have taken so far has been Leah Day’s Free Motion Quilting a Sampler Class. I consider myself an experienced quilter, and over the last few years have dedicated time to improve my machine quilting skills. Although I have no expectations of winning any prizes, I feel I do decent enough work for my purposes. Yet I know these skills can always be perfected. And even more challenging for me has been trying to figure out what design or filler to use at any given moment. The class does begin with some pretty basic things, like how to prepare your quilt sandwich, basting, supplies, etc. The focus is on filler designs, and for this you are given several options: first sew all the blocks from the Craftsy 2012 Block of the Month, or purchase Spoonflower printed fabric with those quilt block designs, or simply use fat quarters to practice. You are also given the choice to work with all the blocks joined into a quilt top, or work with a quilt-as-you-go technique. I opted for the latter one, because although I have worked on quilt-as-you-go projects before, I have always finished them with hand-sewing, and wanted to see how Leah finished them by machine. For the beginner quilter, all the basics are covered thoroughly in this class. Leah is very organized and clear in presenting the information, and the video quality is excellent, with really good close-ups precisely when you need them, to be able to understand the contents being presented visually. The quilting designs go from very simple to more advanced, but none of them are so difficult a beginner couldn’t try them. 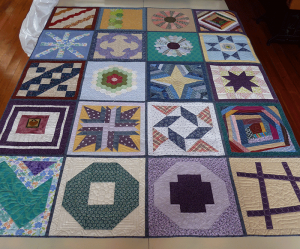 For the more experienced quilter, there is also a wealth of information. Perhaps the most helpful aspect of this class for me was being given clear examples of how and where to use different filler designs. 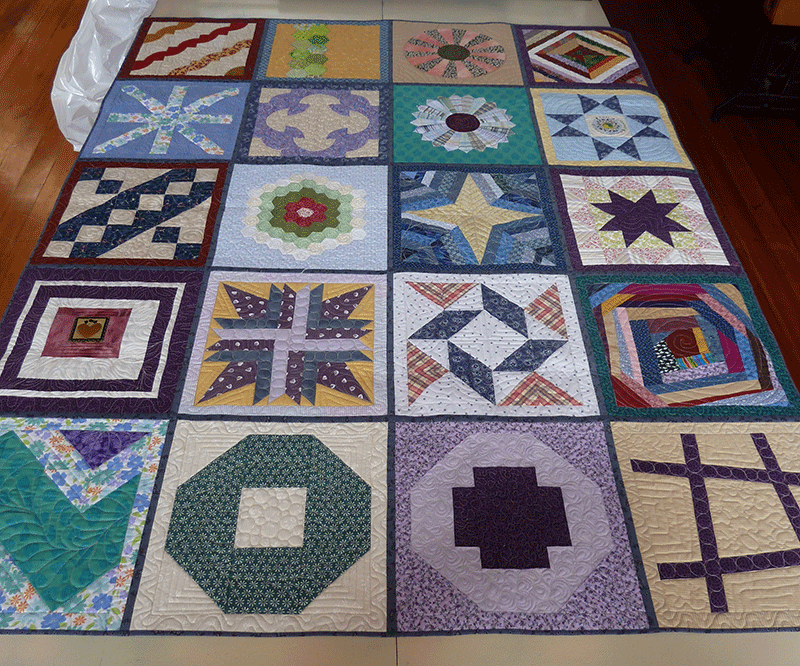 This became particularly clear for me as I had chosen not to sew all the blocks of the BOM, but had used several orphan blocks I had on hand. With Leah’s suggestions, I didn’t find it hard at all to decide how to quilt these blocks. I also enjoyed learning Leah’s method for joining the quilted blocks. There are other methods that I have also used quite successfully, and this was another one to add to my repertoire. I will most assuredly be using it again in another project – most probably whenever I decide to make another sampler quilt like this one. 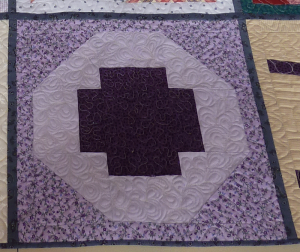 Within the context of this class, the word “sampler” can be applied not only to the blocks, but to the quilting itself. 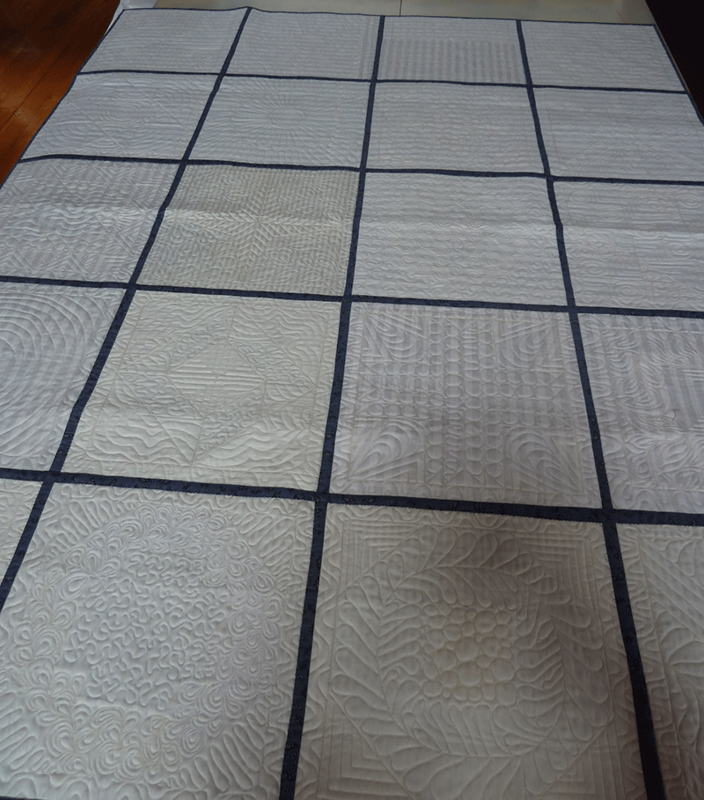 This becomes very clear when you look at the back of the quilt… a true sampler of quilting designs! This is the way the back of my quilt turned out. And I really do like those narrow sashings. My finished sampler quilt is the one I snuggle under while watching TV, or sitting in front of the fireplace on a cold night. And I find myself going back to it to study the designs and consider how to use them in new projects, or simply to refresh what I learned in the class. Don’t miss out on Craftsy’s Endless Creativity Sale! Get ALL online classes at up to 50% off for a limited time only. You won’t see hundreds of classes with prices this low again soon. Hurry, offer expires March 17 at midnight MT.